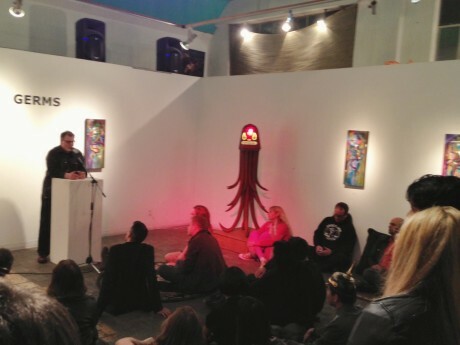 Before we get into our Feral Friday discourse today we’d like to extend big thanks to Billy Shire, Tricia Fetters, Lee Joseph, and Matt Kennedy of Soap Plant / La Luz de Jesus in Los Feliz for hosting such a great event for Feral House this past week. It was great to meet so many friend, see Maja D’Aoust discuss the origins of the Lupercalia holiday, and hear the great Yé-Yé pop numbers as spun by Don Bolles. Adam Parfrey welcoming party goers and discussing the upcoming season. Gene Autry “America’s Favorite Singing Cowboy,” famous for his black and white short films and songs such as “Back in the Saddle Again,” was an extremely wealthy 33rd degree Mason who owned the Los Angeles/California/Anaheim Angels baseball team. 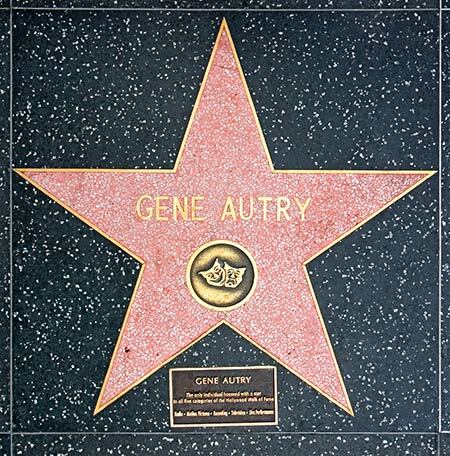 Now dead, Mr. Autry’s notoriety is signified by his star on Hollywood Boulevard’s Walk of Fame. Back in ’65 or so, my father drove me and my brother Jonathan to see a baseball game at the Angel’s brand spanking new baseball park out in Anaheim near Disneyland and a few other strange sites, including a “Deer Park” where one could feed mangy deer with nuts accessed for quarters from a dispensing machine. Today we walked our dog, “Loki” down Hollywood’s Walk of Fame, which I see as a depressing lane of death, where its notable but often forgotten stars are walked on, spit on, and generally defaced by mentally unstable druggies and the occasional confused tourist, who are preyed upon by schemers who pass out flyers for van tours to see the star homes. Loki has spent much of his life sniffing and running in the forested regions outside of Port Townsend, WA, but a couple months this Winter he’s getting used to the city scheme, trotting the misbegotten streets of Hollywood, CA. Today he’s got a troubled digestive system. Loki surprised me by stopping dead center in the middle of the Walk of Fame and letting loose a blast of watery diarrhea right on top of Gene Autry’s star. We’re sorry, Mr. Autry. It was nothing personal. We were a fan of the Angels. Really we were.